SCRAP-LOVE: I am who I am. Just finished my layout for Finding You the second week. Can't tell you anything about the assignment. Just want to share with you that it was hard work and that this layout is filled with symbolism and that I made it on intuition. 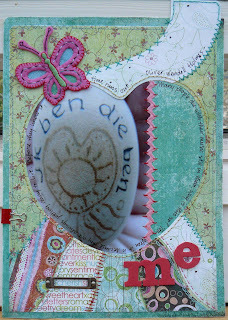 Supplies: pp (BG, SR), felt butterfly (Blokker) altered myself, red foamletters (self made), holder + brads (OTC), red clip (Wibra), ribbon (market), embroidering thread, sewing thread, black pen for DVD. HI! not sure if I have been here yet or not. I read a LOT of blogs the other day! Just wanted to drop a note and say Hi. I am homeschooling 3 boys 10, 12, 13 who have varying degrees of autism spectrum disorder. my 12 yr old was moderatley autistic until I started homeschoolinh him, now he is considred to have Aspergers. Feel free to swing by my blog if you get the chance. Brain Gym- I started by alkin to my boys about the Brain. The Left and Right sides, the fact thatthebrain is 80% water.... My boys, like me, are into science so it works to go about things the scientic route. Then we talked about diferent activities and which side of the brain was used most and what if we did those things and both sides of our brain were working together. I read to them some of the activities. They take turn with ideas of variations on the activities and they take turns leading different activities. PLUS- I statred with ME doing the activities and them asking me what I'm doing and why and joing in- that is a good trick I use to get them to do things. Make them think I am having fun with out them. Dat ei vind ik zo mooi net als de tekst die erop staat. Deze tekst is heel belangrijk voor mij geweest en ik was hem eigenlijk alweer een beetje vergeten, bedankt voor het terughalen van mijn herinnering!